Abu Dhabi’s Masdar clean energy company has awarded a $600 million contract to a European consortium – the Spanish solar company Abengoa and the French oil and gas group Total – to build what it is billing as the world’s biggest single-site solar power plant. The solar plant, named Shams 1, will be located at Madinat Zayed, about 120 kilometers southwest of Abu Dhabi in the United Arab Emirates (UAE). 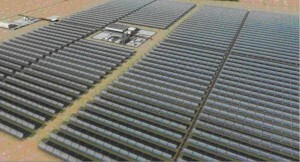 Under the contract, the 100 MW concentrating solar power (CSP) facility is to be ready by the second half of 2012. Masdar will maintain a 60% stake in the project, while each of the European partners will hold a 20% share. According to the Solar Thermal Magazine, Shams 1 will be the largest CSP plant in the world, extending over an area of 2.5 square kilometers and featuring a solar field of 768 parabolic trough collectors. Shams 1 is the first CSP plant registered under the UN’s Clean Development Mechanism (CDM) and is eligible for carbon credits. It will displace approximately 175,000 ton of CO2 per year, the equivalent of planting 1.5 million trees or removing 15,000 cars from Abu Dhabi’s roads.